Address Behind Hotel Deoki Niwas, Gandhi Colony, Jaisalmer, Rajasthan, India – 345001. Distance From Places About 1 km from Jama Masjid. Extra One can also enjoy the Folk dance and music at night during the Camel Safaris. People Love For Place The Golden Sands and the breezy winds and the night Camel Safari is the tourist attraction. Des The most Desert Safari organizers have from Hotel pickup and drop facility and variety of Desert Safari packages. Address Khuri Sand Dune, Jaisalmer. Distance From Places About 48 km from Jama Masjid. Extra One can have a beautiful experience of sleeping under the shining stars.One can also opt for various Safaris from the tents. Opening Hours As per your Camp bookings. People Love For Place Neately managed camps with good quality food and authentic camping experience. Ticket Price Rs.10,000 per tent/cottage for a night. But one can always get some discount offers from Online sites. Des The camp is the mirage of the whole village. A once in a lifetime experience of camping in the desert. Address Opp Sam Dunes, Sam, Village Road, Rajasthan India Jaisalmer 345001. Distance From Places About 40 km from Jama Masjid. Extra You always have an option to go for Morning , Evening or Night Jeep Safaris. Night Jeep Safaris have Tents facility. Opening Hours Either from Morning 5:00am for Sunrise OR Evening 5:00 pm for Sunset. People Love For Place Spacious Camps ,Chilled nights, and entertainment programmes that keep you wanting for more. Ticket Price Rs 2000 for whole jeep, Rs 1000 for 3 pax and Rs 750 for two. Des It is one of a kind experience, Family rides are more fun.Night Jeep Safaris will keep one amused and entertained. Address Kuldhara Road, next to Sam Dunes, Jaisalmer, Rajasthan 345001. Distance From Places About 45 km from Jaisalmer city. Extra Night Life in the Desert Camps are worth experiencing. Opening Hours Open 24 hours.Usually Closes on Saturday and Sunday. Des A good blend of adventure , local food, folk music and dance. Distance From Places 600m from Zee studios office. Extra Refund facility available. Cancellation charges are applicable. Opening Hours Depends on the prior bookings. People Love For Place Golden sand of Thar Desert by flying high. Ticket Price Starts from Rs.1200 and above. One can always awail the ongoing offers. Des -The beautiful land of, Rajasthan is known to be one of the suitable sites for Parasailing in India. 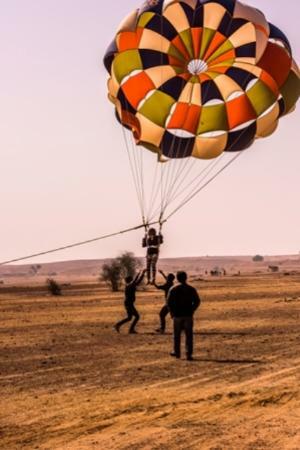 There are runways and strips in Jaisalmer that allows for a thrilling Parasailing activity.